When home buyers go shopping for a mortgage, 90% of them opt for a 30-year term for one simple reason: It’s the most affordable home loan on the market. That is especially true of first-time homeowners, who want the safety and security of a monthly payment they can easily handle. If you put 20% down on a $150,000 home, your monthly payment for a 30-year mortgage (at 4.75% interest) is only $626 a month, which probably is less than the cost of renting. But what happens if you stumble into some extra income five years into owning the home? Suppose you get married and there’s another income in the house or you rent out a spare room and suddenly there is extra money in the budget at the end of every month? That is when it’s time to consider using the extra money to build equity in the home by paying off your mortgage faster. If you already paid five years on the loan, a 15-year mortgage would raise your monthly payment to $828 month. You would save about $38,700 in interest payments and own the home free and clear 10 years faster! Ben Keys, an assistant professor of real estate at the prestigious Wharton School of Business, likened paying off a mortgage early to giving yourself a forced savings account. “Historically, owning a home is a good way to build wealth.” Keys said. “One of the ways people build wealth is not just seeing the price of their home going up over time, but also from the element of paying off your mortgage. When you choose to pay the mortgage off early, you’re sort of tying your hands to saving more on a regular basis month-to-month. If you want to pay off your mortgage faster, refinancing to a 15-year mortgage is just one of the avenues you can take. Sometimes, people are frightened by the higher monthly payment that comes with a 15-year mortgage. If so, consider these options. The most obvious answer is to take whatever leftover money you have at the end of the month and make an additional principal payment. Attacking the principal with extra monthly payments not only will reduce the amount you owe, but it significantly lowers the amount of interest that you pay over the life of the loan. 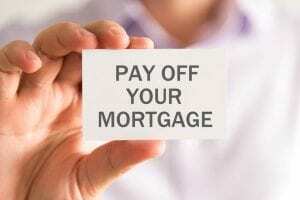 One trick to shorten your mortgage payoff is to pay half of your usual monthly payment every two weeks. You could even have it automatically deducted from your paycheck, if you are on the standard bi-weekly pay schedule. The reason this works is there are 52 weeks in the year, so a bi-weekly payment translates to 26 half payments or 13 full payments per year. That will net you one full extra payment each year. It should also help you manage your budget since most workers are paid bi-weekly. Not all banks offer a bi-weekly option, but this method of paying down the mortgage quicker comes highly-recommended from Professor Keys. “The thing I like about it is that it’s automatic,” said Keys, who authored a paper titled “Failure to Refinance,” which talks about lost opportunities for homeowners. “A lot of research has shown that a ‘Set It, and Forget It,’ method really works for people. Throw all or a portion of new-found money like a year-end bonus or inheritance at the mortgage. The earlier into the loan you do this, the more of an impact it will have. In a typical 30-year mortgage, about half the total interest you pay will accumulate in the first 10 years of your loan. That is because your interest rate is calculated against the very high principle amount you owe in the early years. Refinancing your mortgage can get you a lower interest rate and shorten the term of the mortgage. You might find a lower interest rate depending on what the overall market looks like, but you also should factor in the closing costs associated with refinancing. The rule of thumb used to be that you needed the interest rate to drop 2% in order to make refinancing worthwhile. Now, with the amount borrowed typically much higher, a 1% drop in interest rates might be enough to save you money. One other aspect of refinancing to consider is whether your lender will go for a 20-year or 25-year mortgage. Online lenders and some credit unions seem open to the reduced term and the monthly payments aren’t much different than what you owe on a 30-year mortgage. Let’s assume you buy a $250k home and put 20% down. You take out a $200k, 30-year mortgage with 4.61%, the national average as of May 2018. First, we’ll look at the monthly payments for the 30-year mortgage, the amount of interest that accumulates and what it would take to pay it off in 15 years. In order to pay off this 30-year mortgage in 15 years, you would need to pay an extra $515/month. That’s a big step up from the $1,026 monthly payments. Bi-weekly payments provide a good middle ground. Bi-weekly payments add up to another $86/month, but that extra money will shorten your mortgage payoff by four and a half years. The difference between a biweekly program and the do-it-yourself end of the month payments is only $261. Third-party programs often have a set up cost of $300 plus additional fees, but you can get the same results without the fees with a DIY plan. Paying a fraction of a payment each month rather than saving up a lump sum and making an extra payment at the end of the year will save you over $1,000 in the long run. While very enthusiastic about homeowners wanting to pay off their mortgages faster, Professor Keys suggested that might not always be the best use for extra income, especially for those in the Millennial generation. Alright, taking care of your more expensive debts first makes sense. But let’s say you’ve paid off the student and auto loans and pay off your credit cards every month, yet you still have money left over. Figuring out the best way to maximize your leftover cash can be mindboggling. For starters, there are a lot of places to put your money and paying off the mortgage seems really attractive. So you dive deeper and you’ll realize there are several options. Some homeowners choose to keep their low monthly payments for 30-year mortgages because it frees up cash to invest in other places. Rather than paying extra into their home, they pay extra into an investment that earns more than their mortgage takes. A typical mutual fund should earn about 7% a year in the stock market and is much more liquid than home equity, meaning it’s easier to take the money out. Let’s say you took the $85/month put toward bi-weekly mortgage payments and instead invested that in a mutual fund. With a 7% annual gain, you could return over $104k after 30 years. Compare that against the $29k you would save with bi-weekly payments. A 401(k), Roth IRA and 529 College Plan could produce similar results and have added tax advantages, though you sacrifice liquidity. The main takeaway is that your home shouldn’t be your only investment. If you are already investing long term, then it could be a good idea to pay down your mortgage. But all of this is contingent on whether your home is the only real debt. “Paying down your mortgage only makes sense if you are free and clear of other debts,” Keys said. “What you really need to do is think of this as a way of saving money. Ask yourself ‘Is this a safe investment? How volatile is the housing market in my area? How much risk am I willing to take? What am I saving for next?